For every party the cake is always the center of attention of the buffet table. When planning your Halloween party try out some simple D.I.Y. Fondant cakes. You can purchase already made fondant at most craft stores or any cake supply store. Get creative and try something like Captain Hook inspired cake and have a Treasure Hunt to entertain the little ones. To create the shape of the arm, first bake your cake on a loaf pan. You do not want to make it too tall to give it a more realistic look. Once cooked, let it cool completely before covering it with buttercream frosting. Measure your cake’s height and width and determine the size of the fondant you need to roll by double the height and the width plus an extra inch. Next, if you did not buy already red fondant, spend some time mixing in red food coloring drop by drop into the white fondant wearing gloves to avoid staining your hands. Roll out your fondant to the required size. Then Drape the rolled-out fondant over the cake that is covered with buttercream and begin molding it down into the cake leaving one of the short sides uncovered to later add the ruffles. The buttercream serves as the sticky substance that will keep the fondant on the cake. Mold each side carefully and gently lift and tuck back down where necessary. Smooth it out with the Fondant smoother tool or your own hands. Trim away the excess fondant with a knife or a pizza cutter leaving about an inch to tuck under to give the arm look. Make the hook out of a wire coat hanger (just the top part, cutting the excess wire) and cover it with white fondant. Spray it with silver cake paint (sold in cake supply stores or craft stores) and let it dry. Now cut a few long strips of white fondant and with the fondant ball tool (basically a stick with a little ball at the end) create curls on one side of the fondant strip. Cut the strip into small strips about 4 inches long, making enough to use as ruffles of the Hook Sleeve. Before putting the ruffles, insert the hook on the side of the cake that doesn’t have red fondant. Dampen with water the edge of the strip that does not have the ruffles with your clean fingertip or a pastry brush and start placing the ruffles to cover the side with no fondant. Go creating a wave effect as you go placing the ruffles. 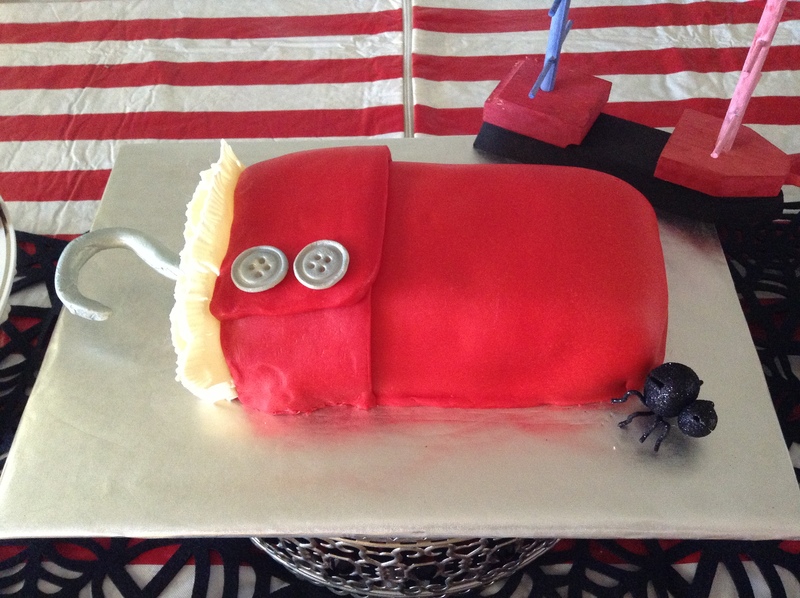 You now have a Captain Hook Fondant Cake for your next Halloween party or Pirate party.